The HD version of Tim Schafer’s classic time-traveling adventure game, Day of the Tentacle, hits PC in exactly two weeks, on March 22. Day of the Tentacle Remastered is all the adventure you may remember with an optional layer of sweet improvements on top. You can mix and match between the unmistakably 1990s pixely art and a fresh high-res coat of paint, remastered audio, and an all new interface. There are extra goodies in the Remastered release as well, including in-game developer commentary and a fully playable version of the original Maniac Mansion. Unfortunately, the announcement didn’t mention a release date for the PS4 and Vita versions of the game. We’ll update this post if or when it pops up. 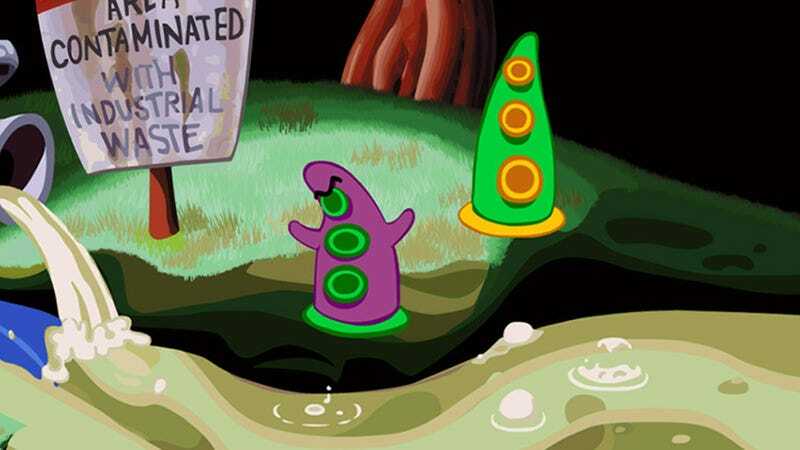 Double Fine Productions, in collaboration with Lucasfilm, is pleased to announce that Day of the Tentacle Remastered is available to pre order today for PlayStation®4, PlayStation®Vita, and PC and will be released on March 22nd. The game will be listed on PlayStation®Network as a Cross-Buy title for $14.99 with a 10% pre-order discount and sports a new PlayStation®4 theme as a pre-order bonus.